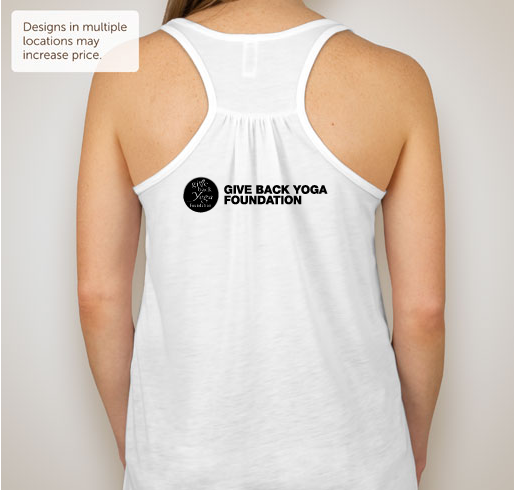 Help people overcome eating disorders through yoga! 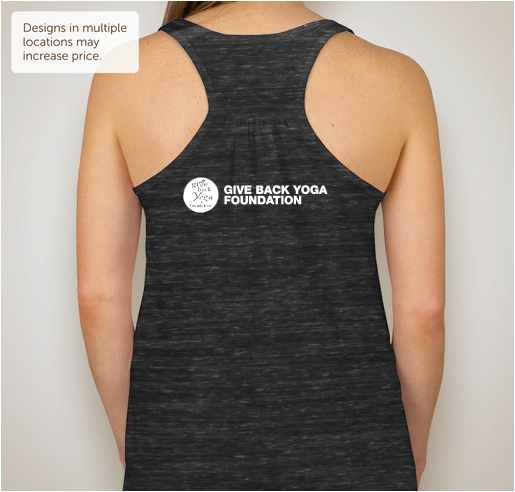 All funds raised will be paid directly to Eat Breathe Thrive for utilizing yoga, mindfulness, and community support to help individuals recover from disordered eating and negative body image. 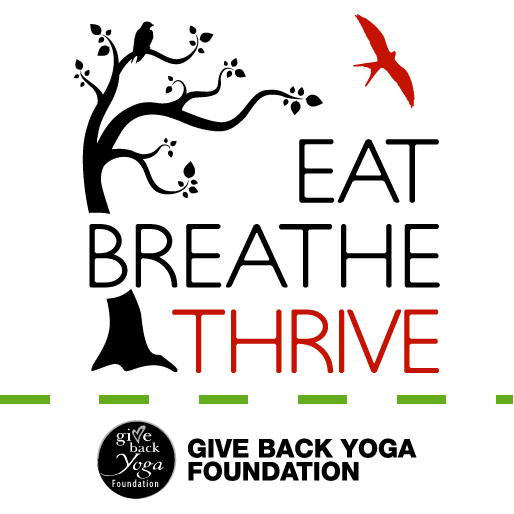 Eat Breathe Thrive™ is a non-profit program of The Give Back Yoga Foundation that prevents and helps individuals fully recover from eating disorders through yoga and community-based programs. Buy a shirt to spread the word and support our programs! 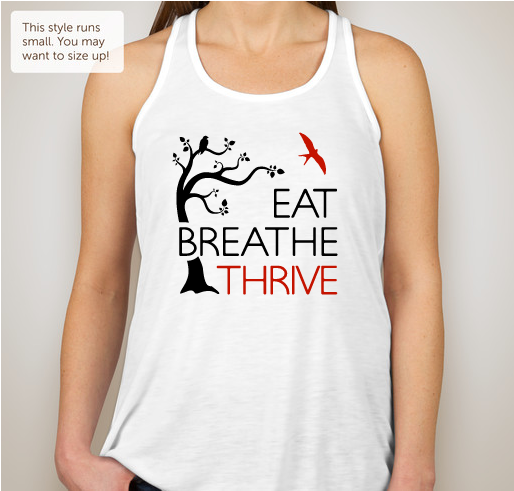 Check out our Red and Black Racer-back Tanks and our Men's T-shirts as well! Check out the sizing chart before you order as these styles run small. $10will buy one packet of materials for a client at a treatment center. $25will buy a client one yoga block or yoga strap. $100will buy three clients yoga mats. $1,000will cover one month of consulting fees with our research advisor. $3,000will cover the costs of one facilitator training. 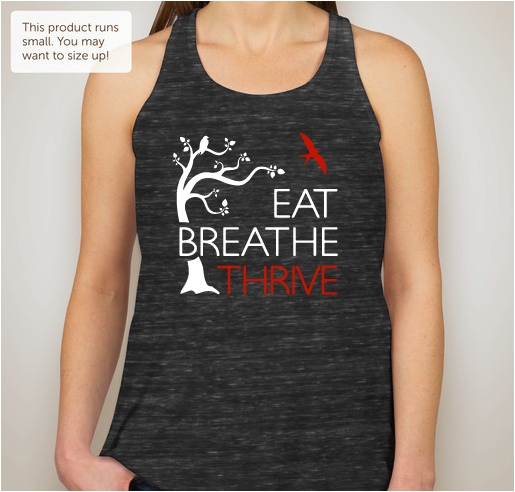 Bringing Eat Breathe Thrive™ to new treatment centers.For every $5,000 raised, we can bring Eat, Breathe, Thrive’s clinical program, Yoga for Eating Disorders™, to one more treatment center. Your contribution will fund materials, support staff, curriculum development, teacher stipends and training programs. Supporting an evidence-based study.Researchers at UC San Diego have partnered with us to determine whether our programs measurably improve treatment outcomes. Our hope is that this research will bestow greater legitimacy to yoga-based interventions in medical settings, and ultimately pave the way for offering the program in centers worldwide. Preventative programs in schools.More than one half of teenagers use unhealthy control behaviors (e.g. fasting, vomiting and taking laxatives) to control their weight. With your support, we can bring programs to young people at high schools and universities, helping them to develop healthy relationships with their bodies and emotions. We can also teach educators how to stop eating disorders before they start. My dear friend and fellow soon to be yoga teacher, Nora, has introduced me to this fabulous cause - thanks Nora!!! I believe in healthy bodies and you are educating and encouraging that. Attended facilitator eligibility training weekend with Chelsea. Want to show my support. I enthusiastically support all efforts to promote healthy body image in a society that historically and oppressively condones unrealistic expectations of beauty. My daughter has been fighting an eating disorder. Thanks for the awareness!! Share Why You Support "Don't Just Survive...THRIVE"